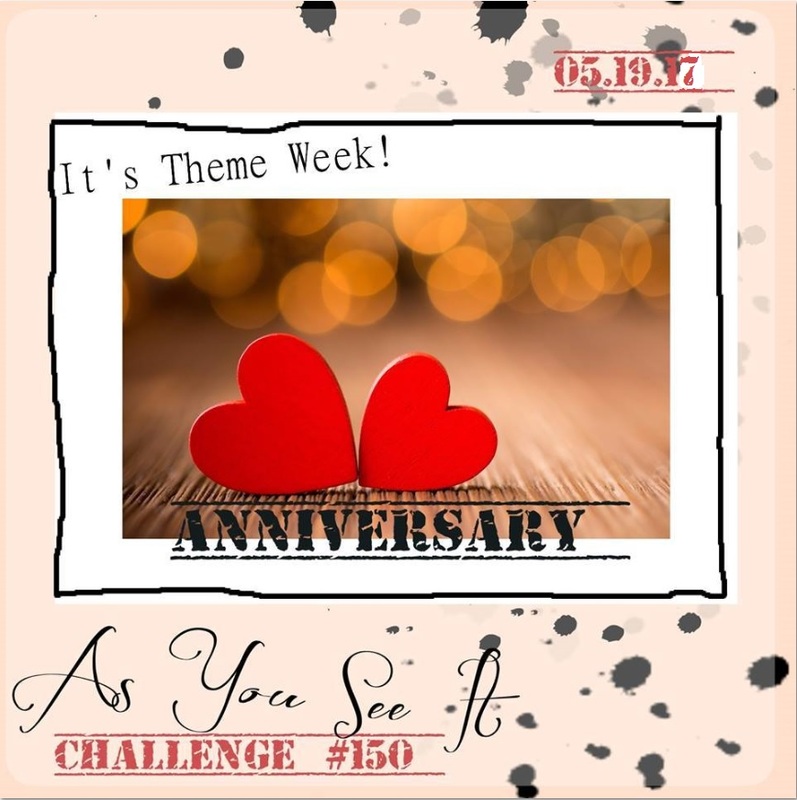 So I set out to make an anniversary card, but as I was considering more traditional ideas, one stamp set from the Occasions Catalogue caught my eye and a whole idea for a card popped into my mind! 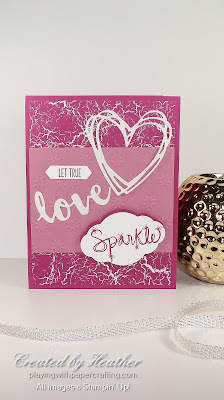 The stamp set was Love Sparkles, and it is retiring in two weeks, so if you like it, it's one that you had better order quickly so that you are not disappointed. Stampin' Up! will only be manufacturing the retiring stamp sets for three more days until May 22 and then it's while supplies last! I used the new In Colour Berry Burst* as the card base and background panel for this card. The Designer Series Paper is from the Colour Theory Designer Series Paper Stack* which is an intriguing play with colours, including paint chip like designs, ombre designs and these crackle designs. I paired it with a panel of Sweet Sugarplum and you can see how well they go together. 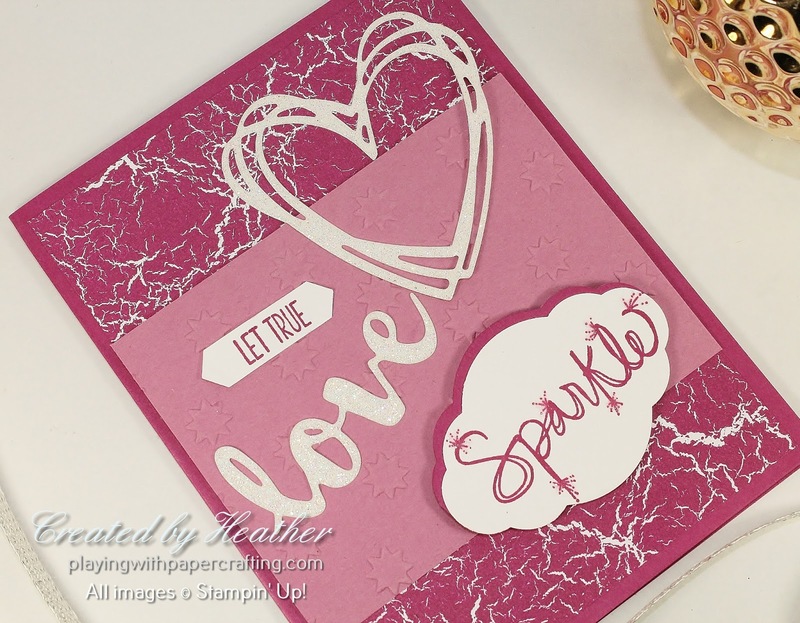 This panel was embossed with the new Oh My Stars Embossing Folder*. In one version of this card, I used Clear Wink of Stella on all the embossed stars, but it made the design just too busy, so I opted for the plain embossed ones. The heart and the word love are die cut with the Sunshine Wishes Thinlits Dies from Dazzling Diamonds Glimmer Paper. It looks much more shimmery in real life than the photo gives it credit for! 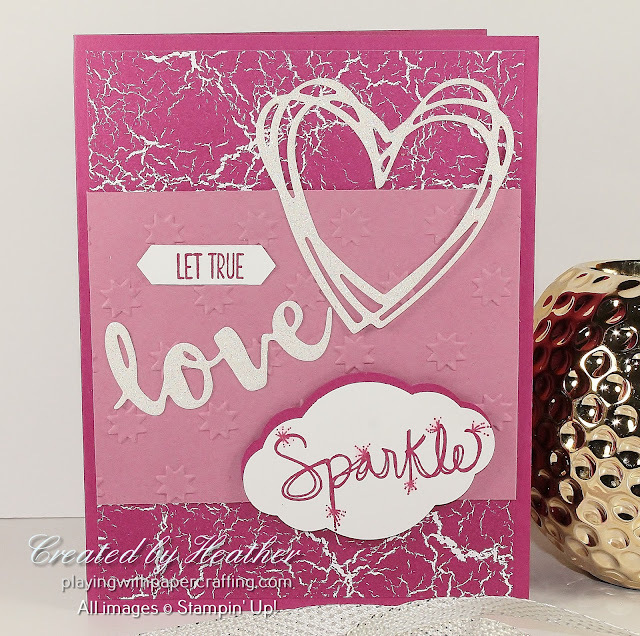 The "Let True" part of the sentiment is from the Love Sparkles stamp set but it is two separate stamps. The first stamp says Let Love, so I masked the word love and just stamped "Let" in Berry Burst Ink. Then I used the Stamp-A-Ma-Jig to get the word "True" placed exactly right. I punched these out with the Classic Label Punch and shortened it to fit the words. Stampin' Up! has a new promotion for NEW Paper Pumpkin Subscribers. 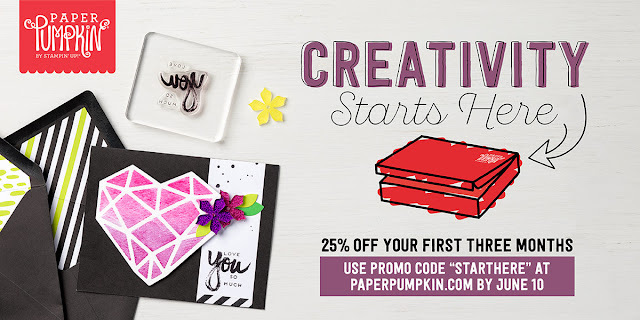 If you've never before subscribed to Paper Pumpkin, sign up to subscribe before June 10th and your first three months will be 25% off by using the Promo Code "STARTHERE". Go to paperpumpkin.com and click on Subscribe. Moon Baby and One More Sleep! !